The one thing however, with anything freshly made, it doesn’t have the longest shelf life unless you freeze it. If you want to change up how things taste in your kitchen, this would be the way to do it. We used it for a base of a cream sauce, over steak and even cooked down some carrots in it. I grabbed a fresh loaf of bread the same day at the bakery and we enjoyed it right over toast. The down side of making homemade butter is that you’ll need a good gadget to get the whipping cream there. I have a KitchenAid stand mixer (Hamilton works as well) but you can make it in a hand mixer or do some exercises shaking it in a mason jar. You’ll do the same processes either way but do note that it’ll make a mess the faster you go. I covered my mixing bowl with a towel and tucked in the sides while it kept working. From here you can add anything you’d like. Wait until my next one! 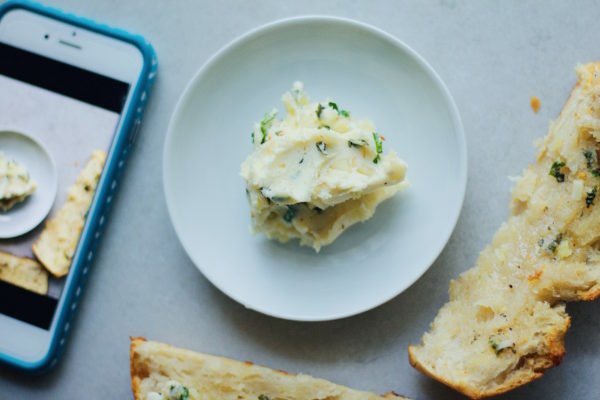 Work out a delicious homemade butter and take a picture of what you used it on/with. Tag me and let me see what you’ve created! Life changing and it'll make you want to put butter on everything. The most important thing to note is that the heavy whipping cream has to be shaken or beaten by arm strength or by a stand mixer or hand mixer. The whipping cream will need to gradually increase to the highest speed (you'll want to cover the bowl for splashing or the jar) and get it to split. You can stop for just a little bit of time and you have to continue to shake or mix until you start to notice the fat separate from the buttermilk. You'll drain the buttermilk, unless you want to save it, and you can squish out any excess buttermilk from the fat. The less buttermilk the longer it lasts (up to 3-4 weeks). Take the ice cold water and pour some over the butter. You'll continue to drain the bowl and pour the cold water over until it has turned clear. From there you can store it or you can add the garlic, basil, parsley. Pink Himalayan salt is optional as well. Place in the fridge after storing or start spreading it all over everything.